Now that we've stuffed ourselves on turkey, here are some fun family activities to fill the rest of our weekend! • The 35th annual Light-Up Louisville, powered by LG&E, will serve as a kickoff celebration to Louisville's Holiday in the City. 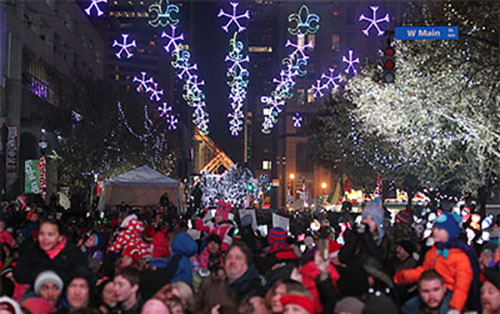 Light Up Louisville will be held today with the arrival of Santa Claus, who will help illuminate downtown Louisville. • Show the giving spirit of the season by selecting a child's name from The Salvation Army Angel Tree. Adoptions are available now at Jefferson, Oxmoor, and St. Matthews malls and will be available at select area Wal-Mart stores tomorrow. Teach your children about the importance of giving while providing one of these 6,174 children something to smile about on Christmas morning. • Be there when the lights come on! Greenway Park is the scene for the countdown to Light Up Charlestown on Friday evening, kicking off several holiday events in the city. • Walk off some of those holiday calories at the After Thanksgiving Full Moon Hike at 8 pm Saturday at Charlestown State Park. The free, one-hour hike will be just over 1.2 miles but offers enough elevation changes to give it a Moderate rating. • Train enthusiasts will love the Holiday Train Exhibit at Yew Dell Botanical Gardens. Starting today, you can see a snow village and model trains, go shopping without the crowds, entertain the kids with a gnome scavenger hunt and visit Santa (on exhibit days from noon-4pm). Wishing you and your family a wonderful weekend!